It’s mid-October already and finally it is beginning to feel like Fall. Brisk mornings, bright sunny afternoons, the thwack of falling acorns, the glorious orange, red, and gold of autumn leaves, and the crackle of fallen leaves as we walk through them – these signs of autumn assault our senses. Take the time to enjoy the beauty of the Fall – hay rides, apple dumplings, cider, multicolored leaves, and, of course, books. Did you know October is actually the time set aside for many special remembrances or events? October is National Breast Cancer Awareness Month, Children’s Health Month, National Popcorn Month, Adopt a Shelter Dog Month, Month of the Dinosaur, Computer Learning Month, and, of course, our favorite, National Book Month. This recognition of books and authors is sponsored by the National Book Foundation. Their website promises: “Embark on the journey of a lifetime, travel to exotic places, mythical lands and experience adventure beyond imagination. Or escape to another era altogether. All without luggage, tickets, a passport or leaving home. All you need is an open mind. And an open book.” Read more about the National Book Foundation at www.nationalbook.org. What better place to find that gateway to another place than your favorite local public library? While you’re in the library, pick up a calendar of events. You’ll find the library to be a very busy place. Story Hours are held Tuesday and Wednesday afternoons. Daisy Girl Scouts and Jr. Girl Scouts meet here Mondays and Thursdays. Scrapbooking is held every other Wednesday. GED classes are available on Mondays and Wednesdays. A special drawing program, Cartooning with Steamer, is scheduled for 3rd-6th graders Wednesday evenings Oct. 8 – Oct. 29. Mom’s Group meets every other Thursday at 1 p.m. The Library Book Club meets Friday, Oct. 24 at 1 p.m. October 16 marks the beginning of the Fall session of Family Place 1, 2, 3 Play With Me. Family Place Library is a very special designation recognizing the library as part of a network of children’s librarians nationwide who believe that literacy begins at birth, and that libraries can help build healthy communities by nourishing healthy families. The Family Place Libraries network currently includes more than 220 sites in 24 states and continues to grow. • Collections of books, toys, music and multimedia materials for babies, toddlers, parents and service providers. • A specially designed, welcoming space within the children’s area for families with young children. • The Parent/Child Workshop: A five week program that involves toddlers and their parents and caregivers; features local professionals who serve as resources for parents; emphasizes the role of parents as the first teachers of their children; facilitates early intervention; and teaches strategies for healthy child development and early literacy. 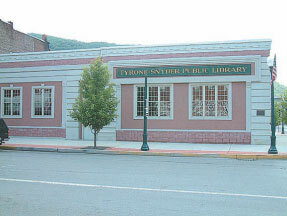 • October 16 – Topic: Literacy – Presenter: Jessica Ford Cameron, Director, Tyrone-Snyder Public Library. • October 23 – Topic: Nutrition – Presenter: Laura Vasbinder, Registered Nutritionist. • October 30 – Topic: Movement – Presenter: Kim Capenos. • November 6 – Topic: Tobacco Effects – Presenter: Kathrine Muller, Altoona Regional Health System Drug & Alcohol Prevention. • November 13 – TBA. • Coalition-building with community agencies that serve families and young children to connect parents to community resources and develop programs and services tailored to meet local needs. • Outreach to new and non-traditional library users, especially parents and very young children (beginning at birth). • Developmentally appropriate programming for very young children and their parents. • Library staff trained in family support, child development, parent education and best practices. Some of the programs above require pre-registration. Please contact the library at 684-1133 to check. Whether you are visiting the library to participate in a program, to check out a book, or to research other opportunities, we look forward to seeing you at the library soon.